Eden Hazard signed a new five-and-a-half-year deal with Chelsea which will see him stay at Stamford Bridge till the end of the 2020 season. Just 24, Hazard has already played 147 games for the Blues and netted 43 goals. His phenomenal bursts of speed, ability to play with both feet and switch flanks with great ease make him one of the most promising young players in the world and a defender's nightmare. Chelsea who signed him over for £32 million in June 2012. His competitive debut for the Blues began with a Community Shield clash with Manchester City and his first Premier League appearance in August 2012 was against Wigan Athletic which Chelsea won 2-0. 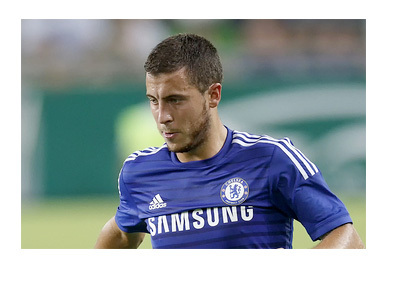 Hazard lost no time in making an impact. It was his assist that helped Ivanovic score the first goal and he followed it with up with a run into box that earned a penalty for the Blues, which Lampard converted into the second. The Belgian got his first goal in the Premier League in a 2-0 win over Newcastle off a penalty. He made his UEFA Championship debut against Bayern Munich in 2013 and although his club lost 4-5 on penalties, Hazard was instrumental in the build up to the first goal of the match and went to score the second himself. One of his most stunning strikes was a 25 yarder in Chelsea's 2-1 win over Liverpool in December 2013. He had a major hand in his club's 1-0 victory over Manchester City at the Etihad in February 2014. It may not have been goals galore for Hazard at Chelsea, but the kind of impact he has had on Chelsea's ascension to the top in the 2014-15 EPL season and their blemishless performance in their European outings so far has caused Jose Mourinho to say that Eden Hazard would become the best player in the world. As if reciprocating Mourinho's compliment the Belgian said that he owed his phenomenal improvement to the Chelsea manager and was full of appreciation for his fans' support and the understanding of his team-mates. The attacking winger's 13 goals in 36 appearances for Chelsea this season may not tell you much of him as a player but when one watches him play, you know he is one of a kind. The reported £57 million deal and the £200,000 a week will make young Hazard among the most highly paid footballers in the world and suggests that there is no player the club wants more for the next five years. Chelsea may have found their talisman.